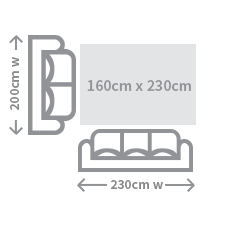 Our rugs are illustrated below using standard two and three division couches for reference and scale. 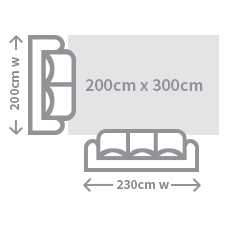 A standard two division couch is 200 cm wide and a standard three division couch is 230 cm wide. Make your parents proud of your taste by contrasting your modern decor with this classic rug. The retro look is perfect for a dining room with a throwback look – think hanging chandeliers, vintage furniture and clashing colours and prints.